Prime Minister David Cameron and his deputy, Nick Clegg, have disagreed over the way internship placements are handed out. Mr Cameron told the Daily Telegraph he was "very relaxed" about giving work experience to personal acquaintances, including a neighbour. But Mr Clegg has criticised the practice as a bar to social mobility. He said plum internships should not go to people "because of who they know, rather than what they know." He added: "I'm not relaxed about this at all." Downing Street played down any hint of a rift between the coalition partners. Mr Cameron said Mr Clegg was "trying to make a fair point" when he argued against the practice of giving internships to the children of friends and colleagues. But the prime minister said he, like Mr Clegg, had been helped out by family connections, with what he called a "definite leg-up internship" at his father's stockbrokers. "I've got my neighbour coming in for an internship," he said. "In the modern world, of course you're always going to have internships and interns - people who come and help in your office who come through all sorts of contacts, friendly, political, whatever. "I do that and I'll go on doing that. I feel very relaxed about it." Responding to the comments during a rally in Norwich on Saturday, Mr Clegg said it was not his job to stop David Cameron offering his neighbour an internship. But he said it was right to "give all young people a fair chance". "I'm not relaxed about this at all", he said. "I think it's very important to give people a fair chance of getting ahead." He added: "That doesn't mean parents shouldn't constantly strive to get the best for their children; that's the most natural thing in the world. But let's at least try to get a bit of openness and fairness in the way in which internships are handed out in government and elsewhere." A Downing Street spokesman said later: "As the prime minister clearly states in the interview, he backs the government's social mobility strategy." Referring to Mr Cameron's remark that he had taken on a neighbour on an internship, the spokesman said: "The intern mentioned is in his constituency office [in Witney, Oxfordshire], not Whitehall, and is from a local comprehensive school." Gus Baker from pressure group Intern Aware said: "He might think he's giving his neighbour a leg up, but what he's actually doing is pushing down other talented young people who aren't lucky enough to live next door to the PM." Mr Baker told Radio 4's Today it was indicative of a wider problem of a culture of unpaid internships which was unfair as it excluded those who could not afford to work for free. "A huge amount of young people are written off because they are not able to access those careers," he added. BBC political correspondent Gary O'Donoghue says it is an extraordinary intervention by the prime minister on an issue Mr Clegg had attempted to preserve for himself. A source close to Mr Clegg said he was surprised by the comments and pointed out that from next year the coalition had agreed that all civil service internships would be available through an open and transparent process. 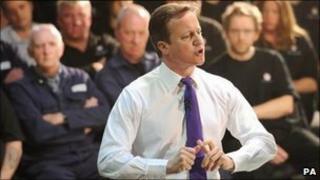 Mr Cameron also said in the interview that he was comfortable with his background. "I suppose when I got into politics I was always called the old Etonian David Cameron," he said. "People know who I am. I'm not trying to rewrite my background. I went to a fantastic school; I adored my parents." Shadow Education Secretary Andy Burnham condemned Mr Cameron's comments about internships. "It is outrageous for the Prime Minister to suggest that there is no problem with the rich and powerful helping out their friends," he said, "while others are excluded from getting a head start in life." He added: "This is just another example of the Tory-led Government kicking away the ladders of opportunity from ordinary families." Is Clegg really a hypocrite?